This is a lay term used to describe a condition that is both simple and yet at the same time complex and only poorly understood. The simplest explanation is that this disorder results from a chronic compression of the spinal cord in the neck caused by multiple factors. These factors include being born with a bony canal that is slightly too narrow, together with subsequent degenerative changes like disc herniations and overgrowth of other soft tissues. These structures cause compression of the spinal cord, often at several different levels within the neck. Instability between certain vertebrae may also play a factor in this disorder. There are therefore three major factors in this disorder, namely abnormalities that the animal is born with, abnormalities that the animal develops as it ages and the effect of instability. What is only poorly understood is what role each of these three factors plays in the final disease process and also whether there is an inherited component to any of them. The disorder has many similarities with Cervical Spondylosis / Cervical spondylotic myelopathy of humans. Figure 11-1: Myelogram of a dog with Wobbler syndrome. At one level there is severe spinal cord narrowing (arrow), which has been caused by compression of the spinal cord by ligament and joint capsule from above as well as from the disc below. Adjacent to this level there is a second level of spinal cord compression caused by a disc herniating from below (arrowhead). The spinal cord is normal and is not under compression at the disc space nearest the dog’s head (*). The relative diameters of the spinal cord at each of these three levels is indicated by the vertical black bars. Clinical signs of Wobbler syndrome include combinations of neck pain and neurological deficits that affect all four limbs, although initially the signs are often more severe in the rear limbs. In contrast to simple extrusion of a [intlink id=”1436″ type=”post”]disc in the neck[/intlink], the pain associated with wobbler syndrome is usually much less severe whereas the neurological deficits are often more marked. Diagnosis is made by imaging the spinal cord using either myelography combined with a CT scan or by using an MRI. The main advantage of myelography compared to MRI is that myelography makes it easy to examine the spinal cord with the dog’s neck in different positions. The appearance of the spinal cord in different neck positions may in turn dictate the type of surgery that will be recommended. The main advantage of MRI is that it is non-invasive and gives excellent detail of the spinal cord. Figure 11-2: MRI of a young Great Dane with Wobbler syndrome. Note the severe spinal cord compression caused by overgrowth of the joints at the top of the spine (arrow). This dog also has a problem higher up its spine, indicated by the white area within the spinal cord (arrowhead) that probably represents fluid accumulation due to repeated, low-grade injury. This dog did very well after his spine was fused at three spaces using a modification of the distraction-fusion technique. Two broad types of surgery are performed in wobbler syndrome. The first type of surgery is to simply remove the tissues causing compression of the spinal cord. This may be done by either a ventral decompression, where the incision is made on the underside of the dog’s neck, or a dorsal laminectomy where the incision is made on the top of the dog’s neck. The second type of surgery is to fuse the vertebrae at the affected level(s) in a position that provides more room for the spinal cord than it had before surgery. This is often called a fusion or distraction-stabilization technique and it can be performed using a number of different techniques. In general, the two main surgical techniques, decompression and distraction-fusion, have similar success rates of between 70% to 90%. The actual rate depends both on the severity of the clinical signs and on the number of level(s) in the neck that are affected. Although there is a small risk of complications (see below), there are no other good options for dogs with obvious neurological signs because non-surgical management is usually unsuccessful in these animals. Strict rest with no running, jumping, stair climbing or off-leash activity combined with use of a chest harness may help animals with mild clinical signs of short duration or dogs that develop signs following minor trauma. Animals less than one year of age may benefit from a severe reduction in food intake but this approach has not been proven and does not help older animals. The prognosis is generally good for dogs with wobbler syndrome that retain the ability to walk (see above). Dogs that are so weak that they cannot stand have a more guarded prognosis, as they are more prone to complications. Complications that may occur after surgery in all dogs include post-operative deterioration in neurological status or loss of stability at a distraction site. Dogs that are unable to stand are also at particular risk of other complications such as pneumonia or gastric torsion. Cervical Spondylomyelopathy. REQUIRES LOGIN; FOR VETERINARIANS In: Clinical Neurology in Small Animals: Localization, Diagnosis and Treatment. K.G. Braund. Modified distraction-stabilization technique using an interbody polymethyl methacrylate plug in dogs with caudal cervical spondylomyelopathy. Dixon BC, Tomlinson JL, Kraus KH. J Am Vet Med Assoc. 1996 Jan 1;208(1):61-8. 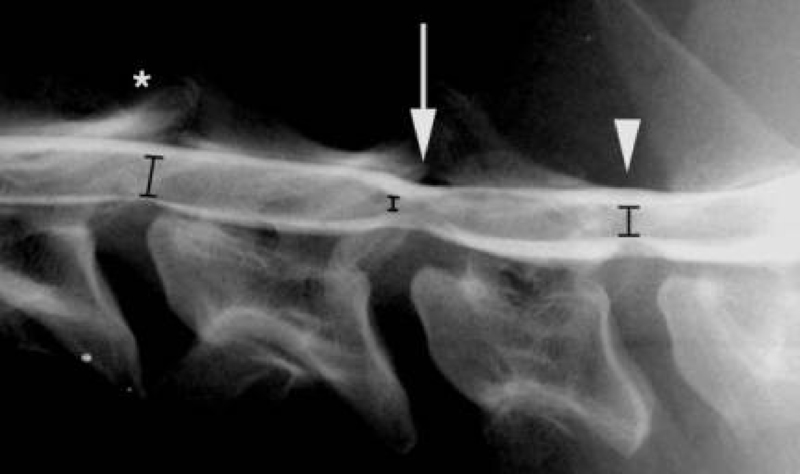 Dorsal laminectomy for caudal cervical spondylomyelopathy: postoperative recovery and long-term follow-up in 20 dogs. De Risio L, Munana K, Murray M, Olby N, Sharp NJ, Cuddon P. Vet Surg. 2002 Sep-Oct;31(5):418-27. 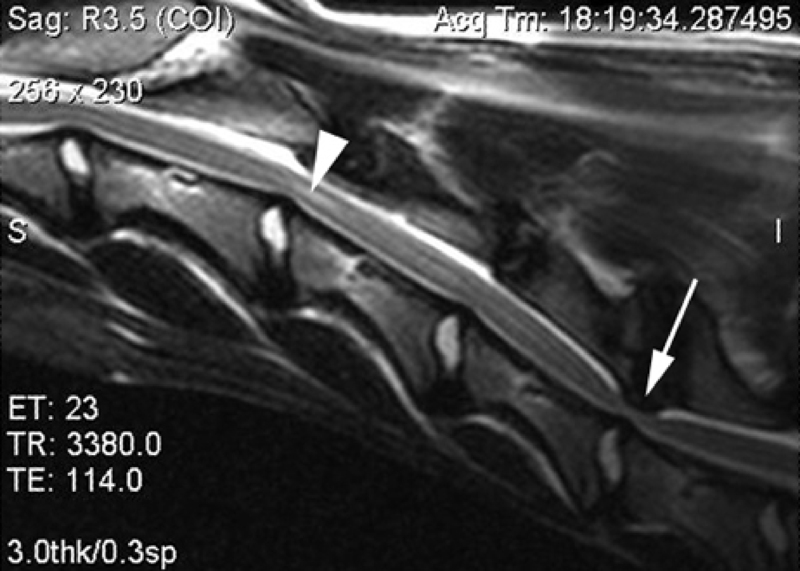 Long-Term Effect of Cervical Fusion on Neurological Status and Vertebral Canal Diameter in Giant Breed Dogs with Cervical Stenotic Myelopathy H. Galano, Olby NJ; Sharp NJH; Skeen T; Muñana K; Early P; Sullivan S. 2005 ACVIM Proceedings. Powered by VIN. Cervical spondylosis. An update. McCormack BM, Weinstein PR. West J Med. 1996; 165(1-2):43-51. Cervical spondylotic myelopathy: Clinical Queries diagnosis and treatment. Emery SE. J Am Acad Orthop Surg. 2001; 9(6):376-88. Cervical spondylotic myelopathy: a common cause of spinal cord dysfunction in older persons. Young WF. Am Fam Physician. 2000 62(5):1064-70, 1073. Cochrane review on the role of surgery in cervical spondylotic radiculomyelopathy. Fouyas IP, Statham PF, Sandercock PA. Spine. 2002 Apr 1;27(7):736-47.